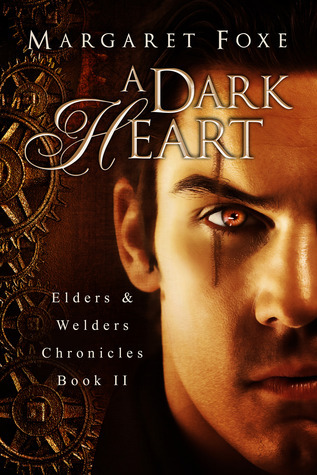 This book – number two of the Elders and Welders Chronicles – is quite an adventure! Lady Christina Harker and Inspector Elijah Drexler were introduced to readers in the first book of Margaret Foxe’s Chronicles, but A Dark Heart is truly their story. In 1888, Lady Christina stumbles across a wounded and dying Elijah Drexler – the man whom she has loved since their childhoods. Herself a Bonded companion to one of the world’s thirteen Elders, she gave her blood to Elijah in order to save his life – and inadvertently transforming the man into a monster. What she didn’t know is that, in saving his life, she made him a vampire. For nearly a decade, Elijah has kept his distance from Christina. Until now, when circumstances have drawn the two together again – and this time, Christina refuses to let him go. Margaret Foxe’s London in the late 1800’s is dark, gritty, and yet romantic – it’s quite an accomplishment of writing. Her world, ruled by a society of elusive and dangerous Elders, is filled with welded abominations – half human, half metal and iron – vampires, Bonded companions, and ordinary people. This story, focused on the haunted and flawed Eljah Drexler, spends much of the time in dark, dangerous, and quite possibly what are the least desirable neighborhoods in and around London. That said, I wanted to crawl into the pages and stay there, watching the events unfold. It’s a testament to the author to say that, as a reader, I felt part of the scenes and story. It’s a talent not all authors have (but they should). No! Well, maybe a little. But SO GOOD. Wanna borrow the books?